In this explanatory essay, a third grader tells how to recycle jars and cans. Recycling jars and cans is easy if you follow these steps. First, wash out all of your empties. Next, take the paper off them. Lids for most jars and cans can't be recycled, so remove them and throw them in the trash. Then put the clean jars and cans into a clear plastic bag or in a recycling container. Finally, put them in the proper place to be picked up. Recycling Jars and Cans by Thoughtful Learning is licensed under a Creative Commons Attribution-NonCommercial-ShareAlike 4.0 International License. 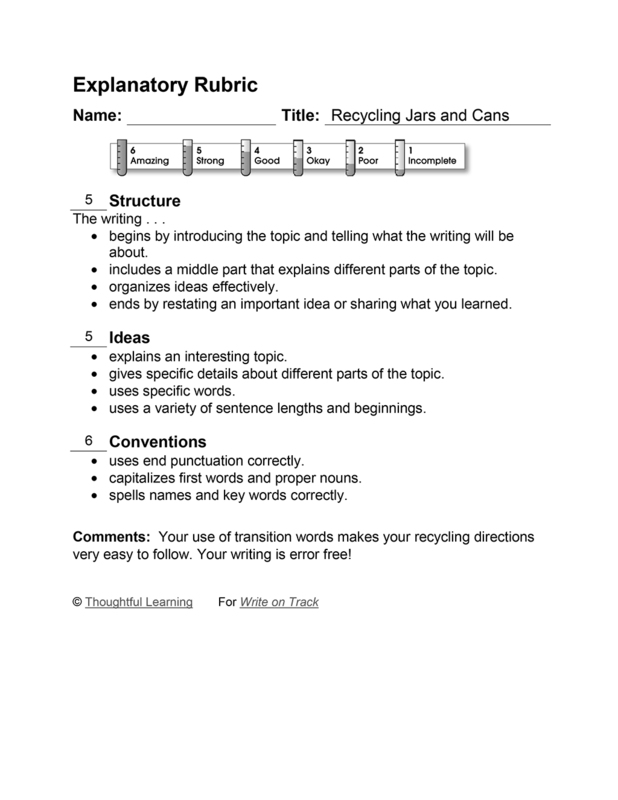 Based on a work at k12.thoughtfullearning.com/assessmentmodels/recycling-jars-and-cans.